What can you do when a neighbor keeps trespassing on your property? Below are some general guidelines for resolving these kinds of issues that apply to all of the specific situations. It’s likely an uncomfortable thing to do, but talking to your neighbor about the situation is usually the best start and often resolves the situation completely without need for further escalation or expense. will help your other neighbors understand that you are just interested in resolving the issue and not “that neighbor” who calls the police or an attorney at the drop of a hat. Assume that they are unaware of the problem. Very often, relationships with neighbors can become permanently strained because there is an assumption that the offending neighbor is intentionally creating a problem; when they are, in fact, unaware that what they are doing is an issue. Bringing it to their attention without asserting malicious intent can often lead to a faster resolution and a better relationship going forward. Particularly if they agree rather quickly in the conversation to correct the issue, be sure to not drone on about it. Thank them for understanding and move on to other unrelated conversation- only returning back to the topic if they do. If the discussion with your neighbor doesn’t yield results, you will need to escalate to the next steps. If your neighbor is renting their property, you can have the discussion with their landlord. In many cases, the landlord will be interested in keeping a good relationship with the neighbors as escalations to police or attorney’s will involve them. More savvy landlords will have clauses written into the leases that help to ensure neighborly behavior from their tenants. Understand the city ordinances that may apply. City ordinances are usally posted on the city’s website. Use this tool: http://www.city-data.com/ to find your city’s website. While it may seem like this wouldn't be necessary, most area laws require posting a "No Trespassing" sign in order to enforce the law. There are many styles of signs that range from inexpensive, basic signs to more expensive but more appealing versions. Any will meet the posting requirement, but some will do so in a less offensive way. You will want to avoid a, “your word against theirs” situation when calling the police. Firstly, you need to keep a log of your neighbor’s behavior(s). This can be done electronically or on paper. You will also want to have proof of the behavior for either criminal or civil cases. Using a standard security camera may act as both a deterrent (your neighbor knows that you are getting serious) and as proof of the behavior. An alternative (or in combination with a standard security camera) involves the use of hidden outdoor cameras. Lastly, you should consider seeking out legal advice from an attorney that specializes in this area of the law. While websites like Bad Neighbor Advice offer practical solutions to minimize neighbor conflict, they are no substitute for professional legal advice. 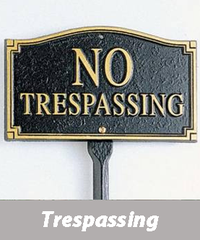 For scenarios around trespassing, it’s likely that an attorney specializing in Property Law would be the best choice.